The notion of the Minuteman has always intrigued me. When I was 6 or 7 years old my father took me to Concord, Massachusetts and we visited the statue pictured above. I walked across the Old North Bridge, which marks the location where British soldiers were met by the Minutemen of Concord and neighboring towns. The British retreated. We that prepare for the unknown call ourselves by many names including “prepper” and “survivalist”. Well, with this post I am suggesting looking at preparedness possibly just a little different and consider joining many of us – and be a Minuteman. Many of you may already be a Minuteman. A Minuteman is someone who is prepared – at a moments notice – to respond to whatever situation they may be confronted with. It may be a simple power outage. It may be suddenly finding yourself near a mass shooting in a mall. It could be walking into a situation where your neighbors are getting assaulted by some drug addict. It may be a breakdown of society and you find yourself and family in a WROL situation. Regardless – you have the gear, the know-how, and the mind-set to confront the situation head-on and deal with it. That “mind-set” is critical. The Minuteman is guided by Faith in God and in Country. They also appreciate the heritage an history of our forefathers – who were Patriots in every sense of the word. 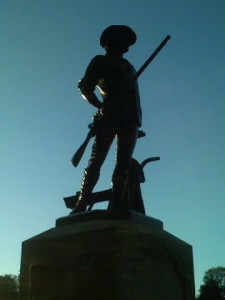 Lexington Minuteman Statue – Lexington, Mass. I invite all of my readers to be one of many ModernSurvivalOnline’s Minutemen. You stand at the ready, prepared…..just in case. You stand ready to defend the Constitution, this country, your community, and your family. Over the next couple weeks there will be a multi-part series covering a recommended set of basic supplies and plans that all MSOnline Minutemen should have on hand. This will involve the home, work, and the car. Many of you may well surpass these recommendations already. These recommendations will be fluid – meaning they can change. In fact, they must change as you adapt these recommendations to your own systems and particular situations. Suggestions are very much encouraged. I want to take an Appleseed course to learn the rifleman skills the Minutemen had… plus hear the history behind Concord in a unique way. Any one else here do Appleseed? Looking forward to this series. As we live near a major railroad in a rural area, the thought occured to my wife and me at the same ttime last night as we heard a train in the distance. What would we do if their was a derailment , and some of the cars were carrying dangerous chemicals that spilled out. Danger to our communities comes in many forms. Talk about “timing”! I was just reading another article online ahead of this one in which the town of Concord, MA has proven its commitment to the Socialist Nation Nanny State – it has now OUTLAWED individual bottled water! They want you to drink the municipal water. Great plan. With it’s added neurotoxic fluoride, nano-particle drugs, chemical runoffs, etc., and, when the grid goes down, you will have – guess what – NO WATER! Or when terrorists strike the town water supply. And so on. Wow. A town that gave us Patriots now has “Nanny State Progressives”, a.k.a, leftwing liberals making the laws, apparently. Sign me up. Time to take back our country and constitution. This country is in DIRE need of a real militia if anyone hasnt noticed. NDAA< drones flying over our heads, expansion of the TSA, and now a proposed gun ban thats going to get jammed down our throats…..Ive been waiting for SOMEONE to step up, and lead and say "Hey, this crap isnt constitutional" and actually do something about it besides complaining about it on the internet. Yeah, Id join in a new york minute! I’ve gone to two Appleseed events and it should be a mandatory event for someone to attend to even be considered a “MSO Minuteman”. It was truly amazing how in two days my groups drastically tightened, and able to hit a 24″x24″ steel gong using iron sights at 500 yards. But you are right being a ‘minuteman’ isn’t just about firearms, but also if gear is involved it should be a common mans gear, not something that is affordable for a few. If you can only afford a surplus Alice pack and not a Kirfru pack, you shouldn’t be looked down on by others. The Minuteman idea dovetails nicely with prepping – Great idea! I recommend the Appleseed marksmanship course idea – it is a great way to kill two birds with one stone… If you are not familiar with Project Appleseed check them out here: http://www.appleseedinfo.org . I attended one with my son and we had a great time, learned a bunch and look forward to attending another. 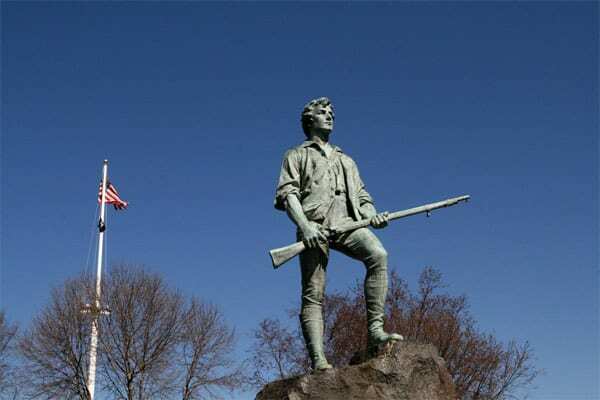 ROURKE- YES-We have considered ourselves to be in the spirit of the Minutemen since we are farmers/land owners .Thanks. My memory isnt exact but as children we learned this poem -someday I will look up the author. YOU !!!!! I taught this poem to our children when we home schooled. I had forgotten how long it was. You have brought tears to my eyes and pride to my American heart !!!! PSI checked out the ammo supplies in Walmart today and they werent enormous but there was a smathering of various types-so keep looking -even if its small orders- hope you all find what you need a.s.ap. I am seeing everything except 9mm, .223/5.56, .22LR – and now 12 gauge is disappearing. Rourke, I was contacted today by my -super secret insider- (code named “manbearpig”) who works deep in the bowels of the Department of Homeland Security. It seems that in the wee hours of this very morning DHS did a new -threat assessment- of MSO, CONGRATULATIONS! your threat level has been upgraded! Apparently many of your resent posts have not been viewed favorably by “Mein Fuher” All this conspiracy talk, and anti-government rabble-rousing. And “manbearpig” wanted you to know that your broadcasting to the world of your ammo goals of 10,000 rounds of 5.56, 5000 rounds of 9mm…. ect. totally collapsed the “Rourke is just an enthusiastic squirrel hunter” cover story. And NOW this… your starting a militia (which everyone on Pennsylvania avenue knows is code for -paranoid, gun toting, tobacco spitting, anti-government, hillbilly racist-) We tried to shield you, and you know that Fedgov has a list of -troublemakers- who will be picked up by the REAL -1st responders- when the milk turns sour… well… your on it now buddy! I’m not a psychic but I see a midnight busting down of your front door and a dozen jack-booted thugs rushing up the stairs to your bedroom. I hope you have a good bug-out location, the gulag is a terrible place to spend your apocalypse years. One more thing…….. SIGN ME UP! In reality – I am a 400 pound women living in Serbia. My hobbies are long walks through the desert, dinner by kerosene light, and braiding my mustache. Between spending time as Rourke and pretending to be this other guy Rawles, I manage a small massage parlor. I HAVE GRIP LIKE STEEL!! Down boy, I’m OK now. Nice talking to you Mr. Gault. I need to go shave my legs. Now, where did I put those hedge clippers? “and pretending to be this other guy Rawles” this is an example of why I know they’ll never take you alive…… a mind sharper than a 300 fold samurai sword….. moaon aabe brother. thanks for posting The Landlords Tale…. I had forgotten it. Paul Revere was supposed to muffle his horse’s hoofs and quickly and quietly ride and warn two important gentlemen that the British were coming to arrest them. He failed his mission. In fact the rumor is he got drunk and fell off his horse and a doctor took up the ride for him but not understanding the importance of the mission all he did was rouse the rabble in Concord. You were young when you visited Concord so maybe you didn’t see or don’t remember the plaque listing the names of those brave Americans who died there. They were no match for the british in a standoff in the open field. There is a better way. Your mission is not to rouse the rabble to fight but to use our heads. This is a political mission not a shooting war. We need to win on the field of ideas not on the field of guns. Kindled the land into flame with its heat.” … prophetic beyond measure. There is only one way to shorten and ease the convulsions of the old society and the bloody birth pangs of the new —revolutionary terror. If I could’ve gotten 51 votes in the Senate of the United States for an outright ban, picking up every one of them—Mr. and Mrs. America turn ’em all in—I would have done it. I could not do that. The votes weren’t here. What is a Patriot to think today? GoneWithTheWind, What if we are not allowed to debate our ideas, what if the -key holders- don’t allow apposing views. What is the voice of decent to do when at every turn it is ridiculed, demonized, defined as -hate speech-, designated as the voice of the -enemy of the state-. What then, and aren’t we nearly there now. I think violence or talk of violence will play into their hands. Let’s not lose the opportunity to get the public on our side. My goal here is to stop gun control if possible, reverse it later if it cannot be stopped and to vote out anyone who voted for gun control. We should become single issue voters. I can assure you there are gun owners who will vote for a legislator who favors their unions or their race/gender. We need to stop rewarding politicians who vote for gun control because they also voted for something we want. I have become a one issue voter now, I will vote against, lobby against and contribute against any politician who votes for gun control, period! Also I have no inention of making phony threats; I won’t tell the politician vote my way or else I will be a gentleman but firm in my resolve. What the other side wants and needs is some angry rednecks slobbering and making threats. I will not give them what they want. I will not resort to violence or breaking the law. If the worst happens and they come to take my guns I will be polite to the police and do what the law requires. But in the political arena I intend to be ruthless and put my money where my mouth is and to vote and encourage others to vote. I am prepared for the likelyhood that we might lose this battle but I am in it to win the war. Let the politicians identify themselves as fascist anti-2nd amendment whores so we can choose to vote them out. Vote in strong supporters of the 2nd amendment. This problem is OUR fault. How many of our fellow believers in the 2nd amendment voted for their other interests or didn’t even vote? We need to turn that around. Strength through numbers. Vote at the local, state and federal level and know who you are voting for. Don’t vote your union or your church or your race/gender politics; vote on this one issue. And once you vote the bastards out don’t let them ever get into politics or public service again. Once they show themselves for who they are then either reward them or punish them accordingly. And no matter what do not give them anything that allows them to paint you as militia or crazy, etc. Take the fight to them. Most of us are not in Reid’s, Pelosi’s or Feinstein’s district so we can’t vote against them. BUT each of these scumbags have used their position in illegal ways to make money for themselves and their families. So lobby your senators and representative to bring them up on ethics charges. Yes I know the congressional ethics committees are toothless but do it anyway. And keep their crimes and mistakes out in the public. Keep bring it up and insist they be investigated. Make them uncomfortable, be relentless, but be honest and polite, they need you to say something intimidating or threatening to change the debate to be all about you. Let’s go after these politicians, expose them push for criminal charges, expose their connections and backroom deals. Also lets print the names of politicians who vote for gun control. Look at previous votes, print the lists of those names on the blogs. Keep doing it. Make sure the gun supporters can never forget those who voted against them in the past. We have short memories so keep remionding us. Dig up dirt on these guys. Show up in front of their offices with signs and picket them, but obey the law. Show up when they campaign or have meetings with their constituients and speak up. But always be polite. If you blow up and make inflamatory statements you will play into their hands and they will use that to rally people to their side. Be loud, be persistent and be polite. If you can have someone video everything. Be aware there will be people there to stop you from videoing by standing in front of you or even violence. Have a big guy to protect your cameraman, maybe two big guys but no violence. have two cameramen, the second one can video the first one to capture any dirty trick they use to prevent you from videoing them. He can be further back and perhaps not noticed. Make the videos that show them for what they are go viral. Don’t allow your fellow demonstrators be baited into saying or doing something to make you/us look bad. They WILL bait you, they NEED to bait you. This is how they win. Think about this; Most of us who support guns have been in the military and played sports. We know how to organize and work as a team. The problem is we are mostly law-abiding people who have jobs and don’t demonstrate or camp out on city property. Well, change all that. Organize, set up teams to work together so that a person speaking up has someone watching their back or someone videoing has someone protecting them. No violence, no inflamatory talk. Stay on point, don’t let yourself be played. No fighting, no fouls, don’t give them something the media can run with to disparage our efforts. To the organizers out there lets get some public demonstrations going. A march on Washington, rallies at your congressman’s local offices. Lets support the NRA, and yes I know their record has been spotty but it’s what we have to work with. Let’s take this public big time, now! I will show up at a rally in my state and if it is possible I will travel to DC. I don’t want to be associated with anything that goes negative so lets keep it clean. Bring your wives and children to encourage peace and calmness. Fifty states we should have fifty demonstrations in front of 50 statehouses before Jan 22nd when Feinstein intends to submit here gun control/grab legislation. We need to do it and soon. Use their tricks against them. If you have an articulate woman who can speak up at meetings then use that because it is much harder for the politician or union thug to fight back against that and if they do by name calling or pushing and shoving then get it on film. They are now using Gabby Giffords to lobby for gun control so get one of your disabled vets to be the speaker for our cause. They may use police or other semi-official law enforcement to harrass or even arrest you so if you have a lawyer in your group who is willing to be there and speak up if that happens use them. Not perfect but a real LEO will not be willing to step over the line if there is a lawyer present speaking up for a potential client. There might be troublemakers there who start violence and then disappear, Use this to your advantage have your own people there hanging back whose only job is to follow a troiublemaker get pictures, license numbers of a car they get into who they talk to etc. Keep a low profile you are only acquiring information not taking justice into your own hands. Don’t bring any weapons, not even a pocket knife. Expect some unknown seemingly sympathetic people to show up but be aware they will first befriend you, then shout racist statements to make you look like racists then disappear leaving you with egg on your face. Make no friends or alliances at these things and make sure everyone understands that. We are not used to dirty tricks and we need to understand how these bastards work so we don’t get run over in the publiuc opinion battle. No threats, no swearing, no “come and take it” statements. Cool heads, better tactics, and stay on point, don’t get pulled into personal fights or arguements. The good news is if you refuse to be baited they will double down on the baiting thus exposing themselves for what the are. Get it on film and post it. And very important, respect the LEOs. Most will be just doing their job and the ones who are trying to screw you don’t need to be given a reason. Let them make their mistakes then sue them in court. No resisting law enforcement. If possible have an attorney available and have video. You will be SO HAPPY when the video shows you being polite and respectful and the officer being the buttface. -It is truly a strange time in which we live. The Russian news outlet Pravda, formerly the mouthpiece of the Soviet regime, has published an opinion column encouraging Americans not to surrender their guns and gun rights to the government. The column warns that the disarming of the population is one of the first steps toward government repression and totalitarianism, and cites Russian history as an example, as this is exactly what happened in Russia when the Bolsheviks came to power. Thank you for the excellent article. I am going to send it to a few friends!